In 2010, Demibooks created the world’s first iPad app for creating interactive books. Originally targeting the iPad 1, this was an ambitious project that pushed the edge of what was considered possible on the iPad, from technical, user experience and design perspectives. At that time few realised the potential of using iPad to create complex content. The goal of the project was to create a tool that authors, creators, artists, animators and educators could use to create richly interactive books, apps and resources… without touching a line of code. As a founding member of Demibooks, Christopher from Cognitive Ink was responsible for the user research, requirements gathering, concepting and design of the Demibooks Composer Pro app. The journey toward an iPad based interactive book creation tool started with the release of the iPad 1 in 2010. For the first time, the iPad combined a full screen touchscreen, graphics capabilities, audio, touch sensitivity and battery life into a single package. From a technical perspective, the iPad came directly with a rich library of programming interfaces that could make use of a number of the devices hardware and software capabilities. Unfortunately, using any of these capabilities required deep programming skills, licences to use Xcode (Apple’s development framework) and a deep understanding of the Apple Developer’s program. Beyond Apple, new entrants to the iPad ecosystem were replicating their game, physics and animation engines to the iPad, providing yet another layer of capability to an iPad app developer. Yet again, deploying or using any of these tools requires deep programming knowledge. None of these technical capabilities would help an author, artist or teacher, as most would little to no programming skills. As such, it was extremely limiting for authors, artists or educators with vision and need. They had capacity to create the assets, images, sketches, audio or video, but they had no way to fuse the assets into a framework. Nor did they have a way to add the layer of interactivity that transformed a static experience into an interactive one. Even though the iPad and associated engines had created the technological platform, they were unable to make use of it. What many artists did have, however, was a vision and drive to create rich, interesting, educational, entertaining and meaningful interactive experiences on the iPad. So the Demibooks team set out to design the impossible. 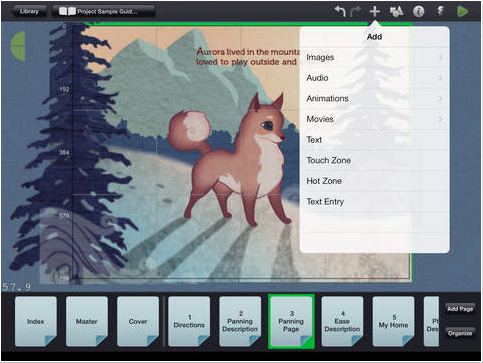 A fully capable on-iPad design and testing app, that would let creators focus on creating, testing and publishing their interactive books, without needing any programming knowledge. The roots of the Demibooks Composer design started with the real world inspiration of authors, artists and educators at work. We worked with Stacey Williams-Ng, who acted as a dedicated user representative. Stacey is an author, illustrator from the United States and provided crucial insights and feedback on how authors and artists created assets, how the authoring workflow worked and what capabilities the tool would need to offer to tell compelling stories. Stacey was interested in turning one of her story concepts into a living interactive book and we used her story, Astrojammies, as source material and test cases for the requirements and design process. Learning from real-world behaviour, and in parallel with the development of the user stories that formed the requirements, we created the backbone workflows that defined the entire application. A rich set of workflows, paper prototypes and research led us to develop more formalised concepts and wireframes. There were so many interrelated design problems to solve that we would often have to pause on creating the framework of the application to deep-dive on a specific design problem. In this example, a deeper exploration of the content library, where users could bring in their content to add to the interactive book. The scale of the problem was obvious early and instead of waiting until we had a final product, we released Composer 1.0 into the market, even before we’d created a final visual design and treatment. We built a user community and selected user champions using Get Satisfaction to learn more about use cases and user behaviour. The combined sources of feedback lead to a radical treatment and usability update with Composer 2.0. Since 2010, Demibooks Composer has been used to create hundreds of interactive books in many different languages, which have educated and delighted children around the world. The app currently has a 4.5 star rating in the Apple App store.